Lovely that you are making your own granola. I would probably eat it all, warm from the oven!. Great as a snack, mixed in with a crumble topping. 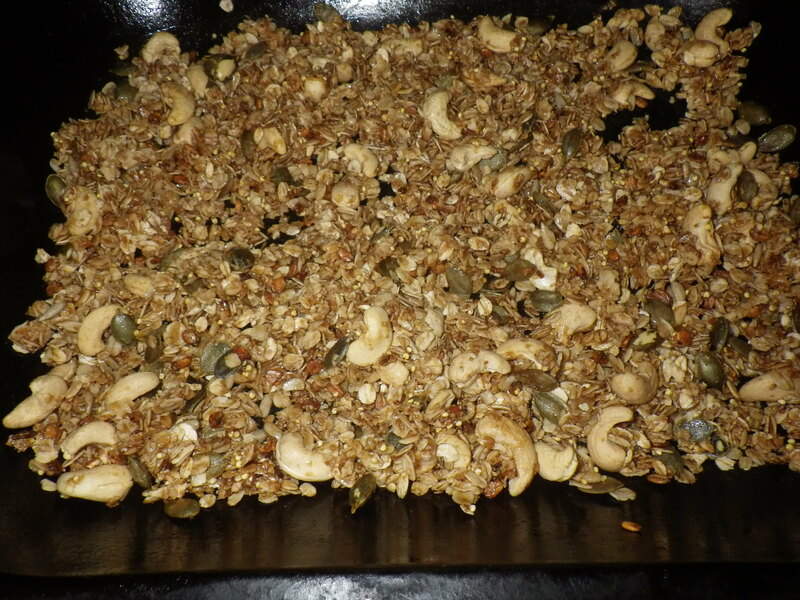 Your very own bespoke granola! PERFECT!-Karen. I’m not sure why I’ve never thought to do it before… it’s one of the few ‘processed’ things that I still buy. And I’m really chuffed that I can use homegrown things in it too. I am, however, having to restrain myself from just munching my way through it! Sounds well tailored to your tastes. Will it keep well? Apparently it’s fine in a screw top jar… bet it doesn’t last long, though! Homemade granola is the best. My favorite wet ingredient is a mixture of fruit juice and honey. I’ve been using a blueberry/pomagrante/cranberry juice mixture with the honey and it’s heavenly. It doesn’t make the granola taste fruity, just sweetness and a little bit sour. It does have to be in the oven longer, but it’s worth it. What a great idea… that sounds delicious. I am trying to be restrained! I have a friend who made yacon syrup last year… I will ask her how she did it and report back!